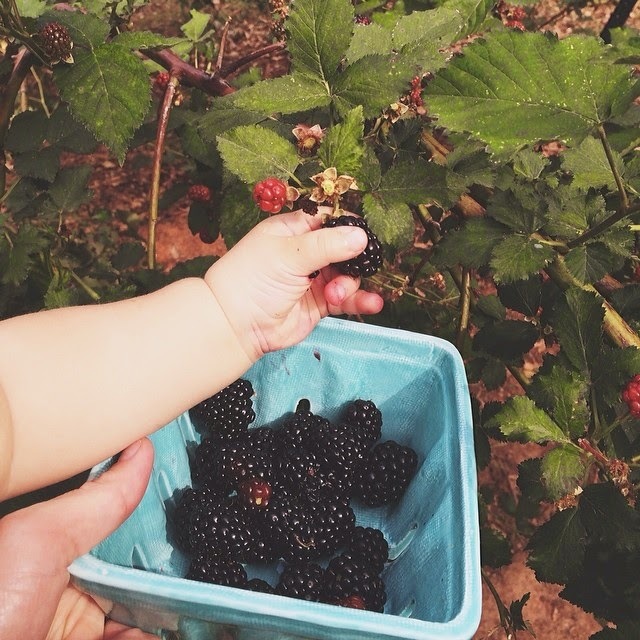 Our blackberries ripened just as we were preparing to leave for France - marking the official beginning of summer, in my book. We picked and froze most of them to later turn into jelly, but for a dinner party at a neighbor's house, I wanted to spotlight them in a dessert. I used Bon Appetit's recipe for Pineapple Upside-Down Cake, simply subbing the blackberries for pineapple. Jim whipped fresh cream flavored with Mexican vanilla to serve on top, and lo, my new favorite summer dessert. 1. Preheat oven to 350°. Coat cake pan with nonstick spray; set aside. Cook brown sugar and butter in a small deep heavy saucepan over medium heat, whisking occasionally, until mixture is bubbling and sugar is completely dissolved. Boil, whisking occasionally, until caramel darkens, thickens, emulsifies, and pulls away from sides of pan, about 3 minutes. 2. Remove from heat and whisk in bourbon (mixture will bubble vigorously). Return caramel to a boil; cook for 1 minute. Pour caramel into prepared cake pan and swirl pan until bottom is completely covered. Let cool completely before proceeding (caramel will harden). 1. 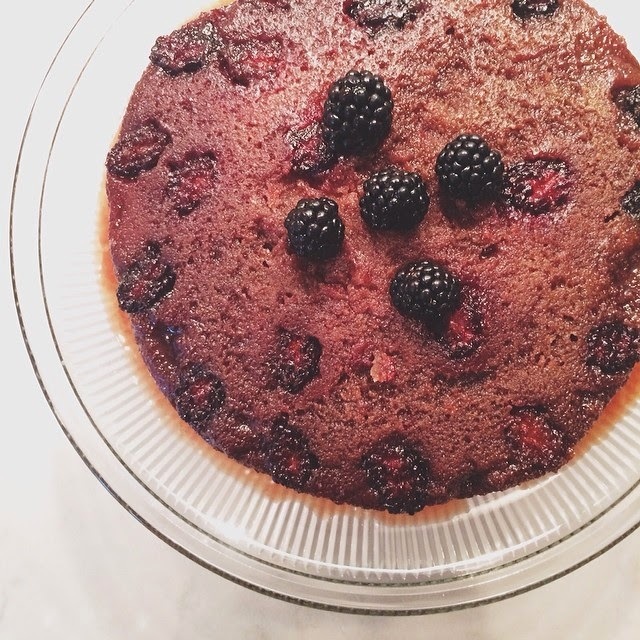 Arrange blackberries on top of caramel in the cake pan, using as many or as few as you'd like. 2. Whisk flour, baking powder, and salt in a medium bowl. Using an electric mixer, beat sugar and butter in another medium bowl until light and fluffy, 5–6 minutes. Beat in vanilla. Add eggs one at a time, beating to blend between additions. Scrape down sides of bowl. Beat egg mixture until doubled in volume and very light and fluffy, about 2 minutes. Scrape bottom of bowl well, making sure to incorporate all butter into eggs. Beat for 1 minute longer. 3. Beat in flour mixture in 3 additions, alternating with sour cream in 2 additions, beginning and ending with dry ingredients. Scrape batter into pan; smooth top. 4. Bake cake until a tester inserted into the center comes out clean, 50–60 minutes. Transfer to a wire rack. Let cake cool in pan for 30 minutes. Run a sharp knife around sides of pan to loosen cake; tap bottom of pan and invert cake onto a large plate. 5. Serve with fresh whipped cream! Everything else in the garden is following- squash, tomatoes, okra, basil, and corn. We had our first garden meal the night before last, rivaling even the best meals we ate in France. One of the lessons I came away with from that trip was less is more, simple is best. More to come! I love this time of year.